With moderate snowfall and cold, nearly 60 people participated in a soundwalk led by Dan Godston, John Barrett, and Eric Leonardson, followed by a concert by Chicago Phonography. Performers included Todd Carter, Chad Clark, Ed Herrmann, Monica Ryan, with members of Chicago Wildsounds, Roni Jachowski, Matt Connor and Lisa Kenny. The site of the soundwalk was the Edward L. Ryerson Conservation Area in the Ryerson Forest Preserve in Riverwoods, Illinois. A rewarding discussion followed both the soundwalk and performance inside the Brushwood Center for environmental education, art, and science in Ryerson Woods. Eric Leonardson asked participants to write about their experiences. "Reflecting on and publishing about MSAE activities helps advance acoustic ecology. It's interesting to learn how different people sense things and apply this to their experience, and in their work. 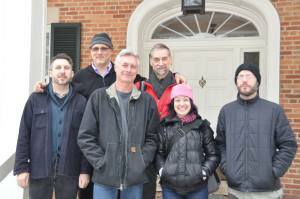 For example, some of the artists-in-residence at Ragdale participated in the soundwalk. One said she focused her listening by closing her eyes as she walked and stood by the river. That heightened her awareness of the sounds all around, and the many footsteps crunching in the new snow. She imagined this must be what a cow hears when standing within its herd. Last night she told me she used her description in the novel she's writing." Author and Ragdale artist-in-residence, Danielle Sosin wrote: "While on a winter sound walk in Ryerson woods, I used my eyes as little as possible, squinting, letting in just enough vision to see the heels of the person in front of me. It was cold, windy, with crunching ice underfoot, rattling leaves, and creaking branches. The experience made me realize how much I rely on vision over sound. With limited sight, my hearing became both more acute and clearly directional. It felt wild, and more animal to rely on my ears. When we stopped near a small river, I stood, eyes closed, as my ears picked up the positions of people milling around me, quietly passing, stopping, shifting weight, and I thought, 'This is what it feels like to be part of herd.'" Chad Clark, MSAE and Chicago Phonography member, also mentions the sound of the leaves, "My attention was drawn to the subtle crackling of the slow flowing creek working its way through a cover of ice and frozen leaves." Chicago composer and MSAE member, Ed Herrmann, reported that "the morning of January 25 was cold, and fresh snow was falling on the several inches already covering the ground. 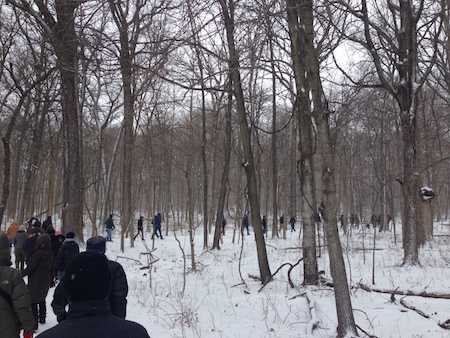 Even so, more than 30 people joined Chicago Phonography on a sound walk at Ryerson Woods. It was quiet. Footsteps crunching in snow and some planes flying over were the primary sounds above the distant drone of traffic, but an occasional bird or squirrel also made its presence briefly known. A few people reported seeing or hearing a deer. My personal favorite sound was a large tree branch creaking as it swayed in the wind. As we approached the Des Plaines River we heard water rushing over rocks and ducks splashing and quacking. We took a different trail back and found a large group of small birds chattering near one of the park buildings. More people had arrived during the walk and the audience for the performance was around 50 people. Chicago Phonography was joined by members of Chicago Wildsounds from De Paul University for a performance in which each participant independently played recordings of environmental sounds ranging from birds, animals, weather, and water to urban, industrial and domestic. Following the performance many members of the audience stayed to ask questions and share observations. A good time and good listening for all." Chicago Wildsounds member, Lisa Kenny, had an expansive and restorative experience. "I expected a smaller and more intimate group, but I was greeted with a much bigger crowd; the intimacy, however, was still present. It really reminded me of not only how important and informative the work and effort MSAE and CWS put forth, but also how cherished the element of sound is, no matter who is listening." 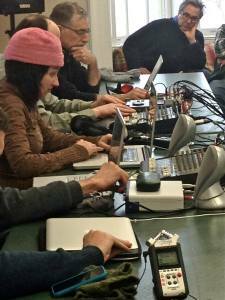 MSAE member Roni Jachowski, also of Chicago Wildsounds, reported that "experiencing a place through its unique sound is a reality that connects us to nature and each other. During our soundwalk with MSAE and the World Listening Project at Brushwood Forest Preserve, I was actively connected to my community and my environment through the simple acts of walking quietly and listening purposefully." On January 19, Barbara Brotman's weekly column in the Chicago Tribune was titled "Sound experts make art of the noise all around us". Featuring an interview and online video of Eric Leonardson discussing soundscapes and phonography, her article vastly increased our media outreach and helped attract a larger than average public.